Title character Lucy (Scarlett Johansson) is an international student in Taiwan when she gets caught up with a gangster, Mr. Jang (Choi Min-sik), who is peddling a new drug. The new drug is apparently the most powerful on the planet, and Lucy unfortunately finds herself with a packet of it sewn into her stomach so that she can act as a mule. Thanks to some rough house by one of her guards, the packet begins to leak into her body, causing her to gain superhuman powers. Like most superheroes, Lucy sets out to avenge the wrong inflicted upon her. As she takes down the Asian gangsters, she also attempts to stop their international drug trade. All the while, she contemplates her new found physical and mental powers. Throughout her journey, Professor Norman (Morgan Freeman) is intercut giving a lecture on the power of the human brain and what might happen if humans could harness more than 10% of its functioning. The science in Lucy, if it can even be called science, is so dubiously preposterous that it only serves as an excuse for special effects and action sequences. 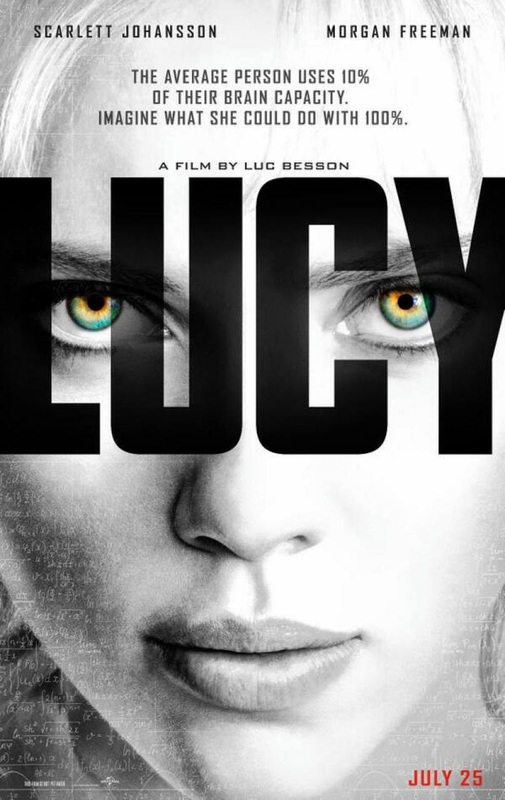 Lucy is no more or less plausible than action films featuring radioactive spiders or aliens posing as Norse gods, but the film is couched with a level of technobabble that coveys authority. All Professor Norman's speeches really account to is that "drugs make Lucy magic." And magic Lucy becomes. Title cards frequently announce Lucy's percentage of brain capacity used, and as it grows, she becomes an expert marksman, driver and more. As it approaches 100%, she is even able to control matter. She is much more like Dr. Manhattan from Watchmen than a typical angst ridden superhero. And like Dr. Manhattan, she gradually loses more and more of her humanity as she gains power. Lucy's main flaw (both as a character and as a film) is how little she cares for civilian lives. It almost appears that she has no concept of good or evil, and more innocents appear to die than gangsters. Thematically, it fits with the character, but it makes it hard to root for her at times. Punching is about to happen. Luc Besson directs the film with aplomb. The film is so bombastic, it has to be one of the few, if not the only, action film to feature both a Creation sequence and a cutaway gag featuring animals mating. Montage, slow motion shootouts, time lapse skylines, cutaway shots, and narration posing as an intercut lecture all lead Lucy to being one of the most visually exciting films of recent memory. Quite a feat, especially given that the CGI here is quite shoddy. Besson also wrote the screenplay. Lucy is preposterous and audacious. What it lacks in scientific accuracy or even likable characters, it more than makes up for in energy and pure conviction.